$5.00 USD Available as Downloadable PDF. I am pleased to announce the publication of my latest ebook, William Neill's Yosemite: Volume One. I have compiled 52 of my favorite images created using film cameras. The majority of the photographs were made with my 4x5 view camera, and the exposure dates range from 1977 to 2005. I have lived and photographed in the Yosemite area since 1977, and so it is rewarding to have finally produced a portfolio of my favorite images. The book was designed in Adobe InDesign with file sizes that have been optimized to preserve the high-resolution image files. The quality of the images vividly comes to life on the computer monitor and you can zoom in closely to examine details within each photograph. 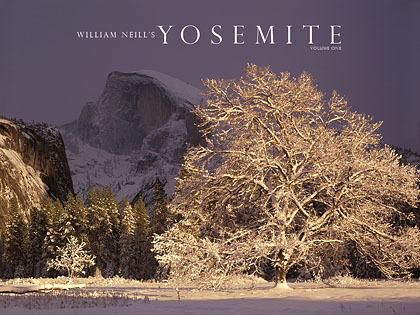 William Neill's Yosemite: Volume One is delivered as a PDF file. Each image is presented on a single page, and so is optimized for viewing the individual images clearly. When you click on each image, you will be taken to a secondary Photo Notes page that includes camera and lens info, my commentary on the making of each photograph, as well as notes on the location of where each image was made. The ebook also offers interaction between each image and the Photo Notes section at the back of the book. When viewing the Photographic Notes, simply click on the photograph's thumbnail, and you are linked back to that image in the PDF. My new ebook can be easily viewed on an Apple iPad, iPod, iPhone or any other device that can view PDF's using an excellent app called Good Reader. I have seen my ebooks on an iPad, and the quality of each image and text is excellent. To purchase this Digital Edition book, just click on the "Add To Cart" link below for a secure and easy e-shopping transaction, using either a PayPal account (if you have one) or use your credit card if you prefer. Upon payment, you will next see a download link for immediate download, as well as receive an email with downloading instructions. These PDFs don't take any more time to download than an album from iTunes!